This little pinhole camera is probably one of the coolest new products we’ve received in a while. 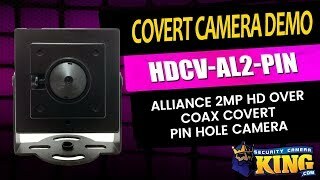 You can connect this camera and place it just about anywhere! Stick it behind a painting and cut out the center of one of the eyes and nobody will ever know that you have a camera capable of producing beautiful 1080p/2MP video @30fps. 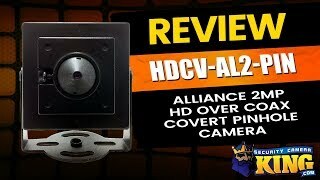 This camera is part of our Alliance line and this tiny hidden camera is a 4 in 1 camera that works with HD-CVI, TVI, AHD and Analog. Imagine being able to put this just about anywhere and having such a clear image using just a good quality coaxial cable and a standard 12V DC power supply! The camera itself measure 1½ inches square and connects to a metal base that allows it to swivel up and down. This has a great 3.7mm fixed lens that gives you a wide enough angle view that you can cover a large area if you need to. If you’ve been using analog or even 720p cameras, you’ll notice the difference and if you ever need to digitally zoom in on your video, you’ll notice the difference and wonder why you never switched over sooner. You can feel confident buying this camera with a FREE 1 year warranty, FREE US based tech support and FREE remote monitoring apps!